At the time the operator made it clear that FTTP and G.fast would be rolled out into different areas, although in practice this could be quite complicated to achieve (the limited coverage and variation in G.fast performance isn’t always easy to pin down). On top of that the Government, Ofcom and many others have been continually pushing FTTP for the future (here). Nevertheless BT Group recently reported (here) that G.fast has so far covered 1,117,000 premises, while their FTTP rollout had reached 631,000 premises, but the latter seemed to be ramping up much more quickly. Meanwhile the G.fast deployment appeared to be going much more slowly than it should have been at this stage. Apparently some providers had similar questions about the impact of the increased FTTP footprint on the G.fast deployment. In response ISPreview.co.uk understands that ISPs have this week been informed that, as a result of Openreach pushing their FTTP commitment from 2 million to 3 million premises passed by 2020, they will shortly revise their G.fast rollout to reach up to 6 million premises by 2020 instead of 10 million. The official announcement is expected to drop in the near future but our understanding is that G.fast will then go no further than c.6 million premises passed, although Openreach are understood to still regard it as an important scale technology and will continue to review for an optimal technology mix between the two services. 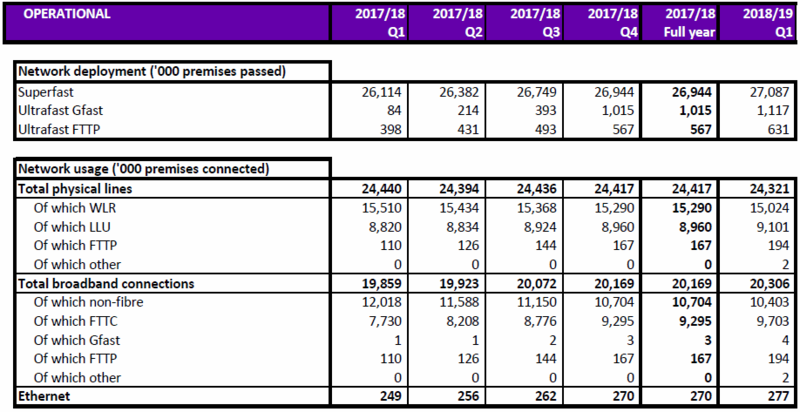 As it stands the FTTP target remains unchanged at 3 million premises by the end of 2020, although today’s announcement does at least lend further weight to the expectation that Openreach will indeed soon be heading for 10 million covered by a full fibre network (i.e. the largest such deployment so far planned by any operator in the UK). 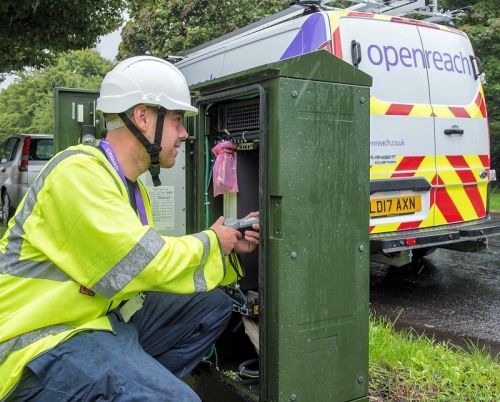 The move appears to be a rational one, although it does suggest that Openreach’s overall coverage of “ultrafast broadband” (100Mbps+) capable technologies will not be as high as previously expected come the end of 2020. However in the longer term it will help to ensure that FTTP takes the focus. The operator is understood to be anticipating a fairly even process of adding premises (between G.fast and FTTP) between now to the end of 2020, while the official update is expected to drop at the next August meeting of the Copper & Fibre Products Commercial Group (CFPCG). NOTE: The specific reduction figure given was 5.7 million premises but we’ve put “up to 6 million” since we understand that it’s subject to variation. What is G.fast? FTTP takes a high-capacity optical fibre cable all the way to your home, but in a G.fast setup the fibre only goes as far as your local PCP street cabinet and then runs to your home via the existing copper line. G.fast can make use of 106-212MHz of spectrum and thus delivers its best speeds for those within c.300 metres of a cabinet, while above c.500 metres you may find FTTC (VDSL2) is better. Sensible but late. However does this mean OR are still locked into entrenched strategies. G.fast (not at cabinet) still has a role to play in hard to access situations such as tower blocks, listed buildings and industrial estates etc. The goal should be giga speeds not a fixation on a particular access technology. FTTP first but nothing wrong with FTTB/FTTdp. If there is sufficient room for cabling and access then yes Cat5e/6 can be used. As fibre costs reduce then it would be cheaper not to have any powered basement equipment and use fibre to each dwelling instead. However if cabling/access is restricted my point is we can still use the telephone block wiring to facilitate giga speeds to each home. We should not dismiss VDSL or G.fast just because of the poor way it has been used previously in the UK by OR. As I predicted on a few threads. There seems to be a serious outbreak of common sense at OR at the moment. Let’s hope it is contagious. Joking apart it is nice to see people unafraid to look afresh at the holy cows. Whatever it is in part it seems to be working, amazingly! Either way lets hope FTTP for once goes smoothly for them (god no more excuses PLEASE) and we can finally put the copper bodge fixes to bed. Hopefully they can meet their aims and personally i hope they can exceed them. I will not be making any bets on it. I guess it is up to them now to show the country they can put their money where their mouth is. Good luck BT/Openreach and i say that with genuine sincerity. I wish them all the best with their ambitions. Good news. G.fast from the same cabinet as FTTC should have never been an option. It’s just faster for the people that don’t need it (yet) therefore the sign up rate was appalling. G.fast/VDSL will likely still have a role to play for hard to reach locations but needs to be from remote nodes closer to the end users. FYI – G.fast usually comes from the PCP cabinet (extension pod), which is different from the FTTC/VDSL2 cabinet. On our street the DSLAM is hard up against the PCP with around 60cm gap and so saving maybe 2m of pair by going from the Pod to the PCP doesn’t really seem significant. I still believe that going for a 35 profile in these kind of situations would have been a better option. Where the DSLAM and the PCP are separated by a long distance, as they sometimes are, the Pod approach some kind of sense. Yes, Gfast has more of a role to play with Fibre to the Basement type deployments. Trouble is that the Alt Nets are hot onto that one doing either full fibre or hybrid fibre catXe which does deliver nG/s speeds so overtakes Gfast. But I think the killer is that the cost of a Gfast pod deployment is actually the same as the cost of putting connectorised blocks onto 4 phone poles. And if I was doing long term ROI planning I know which would have been my preference. They’re not all like that, I think they can be up to 100m apart (VDSL2 cab and PCP), it’s a matter of what works best in any given area. I totally agree. I have seen them DSLAMS on the other side of A roads from the PCP or half way round the block. In these cases the use of a Pod makes more sense but you could equally well do 35 profile VDSL from the pod as well to keep unified technology. Hard to sign up for something you are not offered..
Another small step in the right direction, probably the result of an increased FTTP competition from other network providers like CityFibre, Hyperoptic, GigaClear, and others soon to come. However, by and large, BT is more than decade too late with a wider fibre deployment. Yes they missed the boat a few times but not necessarily. Plenty of scenarios e.g Sky/BT JV or Deutsche Telekom/BT JV? A decade too late for who? FTTC has been doing most people fine up until now. Still is for many. Whilst FTTC has undeniably done well for most for a good long time technology and usage patterns are overtaking it. As a step from ADSL2+ FTTC was a breath of fresh air. To go from 18/1 to 74/18 is a big jump as was the jump down in latency. The sad thing is that if Gfast had not come along 200Mb/s would have been possible for most from the existing DSLAMs with new line cards/firmware upgrades in some cases. And the reach of the 35 profile of FTTC would have been greater than Gfast. There would have been another couple of bands of say 120/30 and 160/40, on top of 40/10 and 80/20, for those closest to the cabs. And the cost of doing that would have been peanuts especially where the cabs are newer and the line cards will support it anyway. Agreed, but to say its more than 10yrs too late just isn’t right. FTTC only started to be rolled out 8yrs ago and was the right progression path to take. Good to see things moving more FTTP now though for sure. On August 1st Deutsche Telekom officially launched their new VDSL2 35b based product with new speeds 175/40 and 250/40 (up from 100/40 17a) in Germany. 6 Million premises able to order right from the start, they want to reach 15 Million by the end of the year. No extra pods, just new linecards. Installation takes less than 5 minutes. First customer feedback looks very good. Many people easily reaching the full 250 Mbps and could possibly reach >300 down and 50 up if the tariff allowed it. Yes, that was rather my point. The technology for this is mature and cheap. It could still be done where there is no GFast. And I would suggest that pods that have not gone live are swapped over for 35 profile VDSL where the PCP and DSLAM are separated. In Germany there is now only virtual unbundling (layer2 bitstream) for vectored cabinets/exchanges above 2.2 MHz. ADSL(2+) still has full unbundling. But not all cabinets/exchanges go to Deutsche Telekom, some also to regional ISPs – usually if they invested more or earlier in the region. Im looking at Three 4G now, 100gb, go binge etc for Netflix and getting a 4G aerial on the roof. Im fed up of BT/Openreach, i was getting 22 megabit on FTC , then openreach went in an underground duct on our street, pulled a junction box out and after that im on 15 megabit banded profile, cheers openreach, and i still pay the same price as people on upto 80. I was hopeful when gfast was announced, pod on the pole 20 metres away, then they said they werent doing that, so now we are back to square 1, our street will never get done. 15Mbps. You’re lucky. Can only get 5Mbps where I am. 4G isn’t an option as usage caps are too low and cost too high. 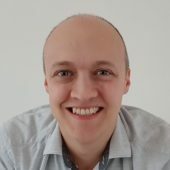 @Tim – Three offer 100Gb for £30pm – I load balance ADSL with 4G which works acceptably (not as good as FTTC/FTTP for several reasons, but the best I can get). don’t do it. look at a real wireless ISP if you want … but don’t do 4G. why ? if you thought contention was bad on regular broadband you ain’t seen nothin yet! I used to use one, a 4G log periodic antenna on the roof…. excellent full signal… could sometimes get 60mbit. Then three started to either get seriously overutilised or they started to drop everything… packet loss… higher ping … went from 60mbits down to <15mbits and sometimes down to 2 or 3. Three were completely uninterested in the problem, blamed everything from my phone (despite it being a Huawaei 4G router not a phone) to the weather!! Mobile 4G networks are not for serious internet use… at least … not on three. now someone will say oh but muh 4G works perfectly and I get 10,000mbits every day constantly… yeah.. well mine worked for a little while too.. I have to agree with Tim, 3 – 4 Mbps is all I can get. BT/OR upgraded our Exchange within the last month to ADSL2+ as well, how exciting, I now get…. 3 – 4Mbps, still at least those closer to the Exchange now receive faster speeds than before, bringing them closer to those already within shouting distance of the FTTC Cab, doesn’t make a blind bit of difference to us further out though, never mind. However, I would love to go full on 4G, I can get 60/20+ on 4G but the data caps are a hindrance. I do have an AYCE plan with 3, the tether cap is 30GB (which I can overcome for everyone in the house :)) but I have to be wise for tethering. Pulling upwards of 800GB a month through a Mobile network would raise flags and owing to the NAT setup with a mobile network it causes further issues (VPN or not), whereas a fixed line is much better so I balance the two the best I can. Tim, if someone in your family has virgin you can get unlimited 4G tethering for £25 a month – that’s not expensive or limiting.. So.. scale back on something I won’t get to give me something I won’t get either..
Hurrah for Virgin Media being around here! Great. So now G.fast for me now then and I’ll never get fttp as I’m in a block of flats. I’ve noticed that I’m no longer on the planned upgrade on the dslchecker page as well. Thanks BT. If you’re in a block then get your building listed on Hyperoptic’s site and encourage your neighbours to sign up. It’s almost a given that they will service the block if the freeholder agrees. @ Mark Jackson – what about those who already got G.FAST connected does this mean this will never get upgraded to FTTP for now? What!? Never is never, it’s not never for now! I told you all as much a few months back after Openreach announced the fibre first plan. Can you please give me next week’s lottery numbers? We are in Glasgow on an EO line was told a year ago to sign up for fibre as we were part of a project to have our line converted to Fibre 1 year later and 7 cancelled orders later Openreach finally admit really sorry but you were not part of the project in the first place. Its now been announced funding will enable fibre for 25.000 homes in the Highlands. Meanwhile homes in Glasgow cant be converted and connected to a cabinet 275 yards away. This incompetency from BT Openreach pretty much sums it up. They keep cancelling the projects. Despite my area being part of Bishopsgate Fibre First Programme and supposedly we are one of the 5% of residents to not even have access to FTTC in the UK I would’ve expected from a matter of courtesy that they would at least upgrade EO Lines by now with FTTC. They can’t even do that, so I wonder how they’ll even make FTTP happen! EO Lines seem to be problematic and the 5% of residents such as us who have no FTTC are all on EO Lines. Maybe 95% access to FTTC in the UK is a lie. :S We’ve got 3 different properties in London under 3 different exchanges Shoreditch, Bishopsgate and Stepney Green areas and on all of them no FTTC and are on EO Lines!! Really? Have you been working on plans to provide a house in central London for the past 7 years I have been checking? Really? So my taxes have been paying for rural England to get FTTC for the past 7 years but the government decided those taxes could not be used to provide me with FTTC… sounds fair. Yes I am stuck on a EO line in the Greenland Dock London SE16 and Openreach are still exploring solutions – think they have had long enough to explore solutions and come up with a plan ! I’d like to see EO lines as a priority – whether they are in urban or rural areas. Even with BT prioritizing FTTP it will take years and years to resolve the EO line problem. USO won’t help many, as the costs will be above the threshold. I’m not sure that all EO lines are in the same basket. It depends how they are supplied. Direct buried EO’s are a nightmare but one that needs to tackled: but these are few. Ducted EO’s can also be very hard with the duct branches not accessible and the only way being to pull out the copper and hope the steel barrel duct to the premises is in good enough condition to blow fibre through. There is a lot of this in SW LONDON. And then there is the majority easy standard build stuff which it is a mystery why OR has done nothing about. Although historically OR has tended to not want to tackle EO lines as they generally cover business districts and so providing FTTC or FTTP would damage leased line opportunities. Conflict of interest. Rahul are you offering to help with the Gap fund to help enable the case ? @A_Builder, I agree EO lines are a problem – that is why I think they should be a priority. Unless they are specifically targeted they will always be left until last precisely because they are often more difficult and therefore less cost-effective. In my case, the bundle with my line is in a clear duct, with no difficulties in rearrangement other than the cost of moving the bundle to the cabinet that was built 50 yards from the exchange just for that purpose. BT/OR had planned to do that as part of the BDUK FTTC rollout (originally all the lines were EO) but were vetoed by Fastershire as some properties in the bundle wouldn’t have achieved 30Mbps. @Fastman: It entirely depends on what kind of service I get. Even with FTTC I am not quite prepared to contribute any funding. Why? Because I’ve already waited for almost a decade for a partially outdated service that has no guarantee of providing good speeds or reliability should the green cabinet that they will install not be sufficiently close to my property. If BT OR install a new cabinet but that only gives me 30Mbps for example I am not going to give any funding for that given the fact that I live centrally in London and there’s no excuses for BT to say that this investment would be too costly or not bring any return on investment. In this case it would be false because there are people in Zone 5/6 in London with FTTC already, why should I pay for funding when I live in Zone 1 after so many years of waiting when others have not and live in more remote areas that gives less ROI? Is that fair? However, if this was FTTP then yes I would be happy to contribute some money towards BT. But the way they have treated some of their customers, FTTC is not something we should pay for, not after that many years. It is like demanding £200 for a Quad Core Q6600 2.4GHz CPU from 2007. Of-course the value of it is not £200 anymore but £10-£20 & nobody is going to buy it even for that money considering much better technology available right now. And it is FTTP that is the newer technology that I am happy to pay for. The question I have is if BT OR have no plans to upgrade EO Lines to even FTTC, then who will be the initial 3 million to be upgraded with FTTP by end of 2020?! Surely that’s not going to be existing FTTC customers! Common sense should indicate from a matter of courtesy that the priority is for people who don’t have FTTC/G.Fast and have suffered for long enough to deserve to be finally upgraded with FTTP and if that doesn’t make sense then BT deserve to be boycotted! I have previously posted a similar experience where I was prepared to pay for the work to be done on an industrial estate I won part of. The cables run in the same duct as the ones to the PCP. OR gave us a price which was crazy, £30k to simply determinate some wires, but I agreed to pay it. The OR survey guy said the job was easy and could be done in a day. Even then nothing happened and they simply stopped responding. So even waving cash under OR’s nose seems to have no effect. We ended up getting initially 4xFTTC to one of the units that could get it that was 100m from the PCP. And then ultimately pure fibre line from others and as we ran our own LAN/WAN setup. Works very well and at least we can rent the units saying they have decent connectivity with a straight face. Thanks – so that’s FTTC? It was all done officially through proper channels. I sort of believe that a team could have decjoimted and rejoined and tested it in a day with a fair wind blowing. I say sort of as I live in the real world too and nothing ever goes quite as planned. We had the price on OR headed paper. Signed the acceptance that came with it and then nothing. Never got the invoice chased the individual(s) several times . Initially they responded and then it became clear that they simply were not interested in facilitating the works. Maybe workload maybe internal policy: who knows so we moved onto the homespun solution. Not interested in going back as what we have keeps everyone happy. My impression was that the planning terms for this kind of work are not big and have a lot on. I’ve just reread you question and should have been clearer. I part own some industrial units that have EO lines. The tenants were not happy with connectivity. So as plan A we approached OR about getting the EO lines connected to the PCP with a DSLAM right beside it. The EO cables runs through exactly the same duct as the non EO cable as the DSLAM & PCP’is are against the wall of the exchange. That particular EO bundle only serves the industrial estate so we could agree an interruption in service to make the rearrangement easier to carry out. The PCP has capacity as did the DSLAM. I suppose my point is that I don’t believe that most of the EO issue are that complex to solve. They are really just a well worn excuse to do nothing, A bit like the old blocked ducts excuse. Main reason that most EO’s haven’t been upgraded is the leased line market. And that is pure conflict of interest stuff. @A_Builder – rearrangement of EO lines is conceptually simple like most things, but in practice you need to divert and break into the existing cable with all the civils, jointing and continuity of service, install a cabinet where there is none, arrange power and then provide the electronics as well – as has been mentioned on other sites it is more difficult and more costly than adding a VDSL cabinet alongside an existing copper one. Posts suggest that most EO rearrangements are actually residential oriented to a high degree and not focused on business premises. The big con… BT will be bumping their figures by using new builds. Around 27m homes exist in the UK, the government are back on track for making 1m homes a year, so in 2025 there will be around 34m homes in the UK. BT proposed a 10m target which means less than 30% of the UK will get FTTP. Since there will be 7m new homes. Out of the 10m FTTP install proposal, how many of these installs are going towards the 7m newly built homes? The Government has discount schemes for new builds to install fibre also building developers are now opting to self-install the Openreach equipment that delivers Fibre to the Premises in their developments. – Less than 30% of the UK will have FTTP in 2025. 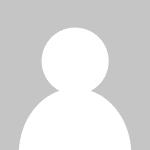 – More than 60% of the UK will remain on ADSL2/VDSL2. Simply put, it’s not good enough. That’s what I’ve been saying before. There is no way the UK will achieve 50% FTTP by 2025 let alone 100% FTTP by 2033. 30% is a more realistic figure and possibly 60% at the very best by 2033 but it’s not going to be anywhere near 100% particularly as the wayleave barrier in itself will take years to overcome! You know I believe these lies are made by Philip Hammond simply because Tories aren’t doing well with their Brexit negotiations. He is now lying about FTTP targets only for popularity. He has no idea, he as a politician who doesn’t read these sites or been in most people’s situation when dealing with wayleave agreements. Obviously it is very easy to say this and that only so they can be put off the hook. But in reality only action will achieve these targets. Considering how so many EO Lines have yet to be upgraded with FTTC and even BT Openreach aren’t announcing plans for many if not most of the EO Lines. I also question myself who will be the 3 million FTTP premises to be upgraded by 2020? Then I believe the initial 3 million premises will be a mixture between office buildings and newly built homes. That is also not going to be a welcome news for most of us! We have yet to hear anything from Clive Selley, Kim Mears or anyone else from BT/OR regarding EO Lines whether they will be upgraded with FTTP. Because so far almost a decade no reassurance for FTTC yet so if FTTP is not going to come then I wonder who will get it?! You are also assuming that there will be 1 million premises per year, a long way short of that currently, but yes 15 million FTTP is probably going to be under 50% in 2025, how close depends on many many variables. Well Virgin no longer have to deal with wayleave – so maybe they will take over? A million homes a year? Are you insane? No-one has claimed that could happen, it can’t. Even if we weren’t leaving the EU and retained full access to their labour market we still couldn’t get much past 250k, 300k at most with extensive policy. Estimates for completions between 2018 and 2022 are forecast to average 205k completions a year. We haven’t built 300k a year for decades. 1. Universal Service Obligation (USO) does not apply for me as I get between 12-16Mbps here near City of London Zone 1. USO is typically aimed at people in rural areas who can’t even get 10Mbps. But of-course my problem is not just speed. It is reliability as well. I can get 16Mbps but the connection is unstable and within a few days it will drop out due to poor noise margins dropping to below 3dB. So when Dynamic Line Management (DLM) drops my connection to 12-13Mbps and puts my noise margin up to 10-12dB then my connection is stable for weeks onwards. My line is EO Line BT Engineers can’t detect a fault. 2. Co-funding is not my problem here. It is wayleave with the building authority. My building has 82 flats, 20 floors, 50 leaseholders/freeholders including myself. There’s plenty of demand. But as it is privatised it is the Building Estate Managers/Technical Services Managers who have the final word on whether to give ISP’s the permission to install Fibre. 3. Your assumptions are incorrect because as I have mentioned before Hyperoptic are very much interested to install their service in my building. I’m a Hyperoptic Champion of my Building. More than 3 years ago I managed to convince the neighbours to register their interest. Within less than 6 months 30+ of them registered their interest most of it being word of mouth. Hyperoptic have expressed strong interests to meet with my Building authority to request wayleave permission but the authority ignores and says does not want to install Fibre at this stage. They have regularly been calling them. Even the building authority admitted that they aren’t being left alone lol. But somehow my authority is thick skinned and aren’t bothered by the phone calls from Hyperoptic. This is why I have been here emphasising why 50% FTTP by 2025 from current 4% is unrealistic because like my building there will be hundreds of other buildings stuck with wayleave issues that will disrupt the FTTP UK expansion mission. @Fastman: The ball is not firmly in my court. It may look so, but it isn’t not unless my authority was more cooperative. I mention these senior people because they are the ones responsible to inform us with more information. Kim Mears mentioned about 3 years ago that by the end of 2017 95% of the UK will have superfast fibre. I knew it was a lie because as we know City of London only 59% have access to FTTC, I am amongst this bracket. With majority of all areas being on Exchange Only Lines! But that is “some cases”, not “all cases”. After Fibre First Programme has been announced they don’t mention for example which areas from their exchanges will be covered with FTTP. The developer / Managing agent will not fund a fibre cabinet in the basement comms room! They have not provided Hyperoptic wayleave clearance that costs 0 pence and you expect them to fund for a cabinet? Lol, of-course not. They have already said that they’ve spent a lot of money on fire safety, building decoration works, etc. I’ve been observing this wayleave issue being stuck last 3 years in many buildings across London, not just my own. Wayleave is a serious obstacle and not something to be taken lightly. @Rahul – do you pay a service charge? Is there an annual meeting? The numbers will work without the ‘problem’ buildings. @TheFacts: Yes I do pay service charge. There are meetings every few months or so with the building authority in their local Estate office. But the Technical Service Manager is never there so we can discuss this. Usually it involves housing estate manager and it is more relating to discussion about general maintenance issues/works, fire safety, etc with the leaseholders/freeholders. Like for example the recent discussion was about re-cladding works finding a material that is fire safety resistant, etc. When I try to speak about Fibre, they say “not at this stage” or refer me to the Technical Service Manager which I can’t get hold of. They say more important matters need sorting out first like the re-cladding but Fibre is in their plans but not right now. I did mention this before. But of-course this is another important issue that gets in the way of discussing about Fibre broadband which the building owners view that as a luxury rather than priority. Also while there are 50 leaseholders/freeholders only a fraction of them permanently live in the building, the rest only use the flat for renting out business so it is difficult to even discuss with them because they don’t attend those discussion meetings. 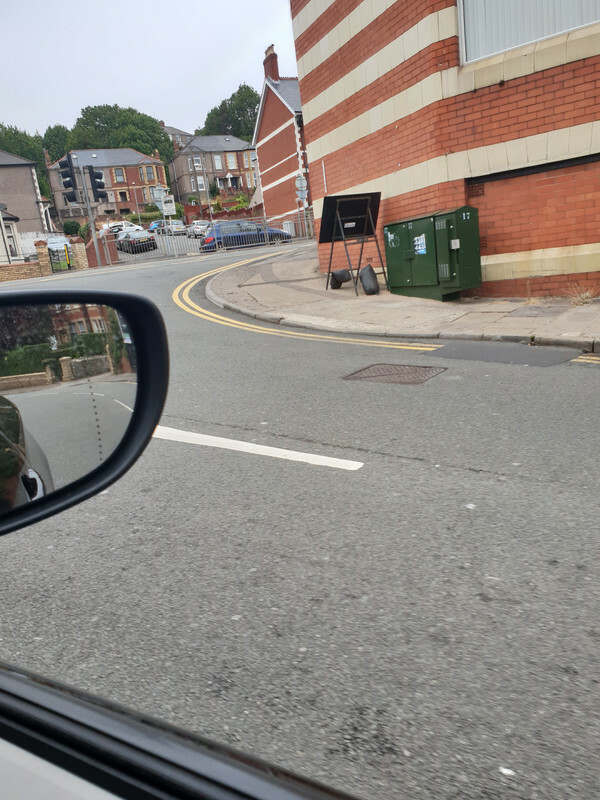 They can’t even cover a city properly let alone in the sticks – got a G.fast pod a mile up the road on another exchange – nothing for us – and it’s on a cabinet which covers very few properties and 1 pub. I was sort of wondering if you had read the thread? For precision of have gone through your post line by line. Actually not in this case the guy from OR identified that it would be easier to simply cut the existing cable where it went into the basement of the exchange and pull it back in the duct a few manholes down and then pull it up into the PCP where there was space and spare pairs running into the exchange. There were no civils or jointing in this case. Everyone was prepared to sign a waiver for continuity of service in the interests of getting the thing done. There was no need for an extra PCP there was plenty of capacity in the one that was there. PCP’s don’t need power the associated DSLAM was there and had the requisite number of spare ports. It was all already there. This rather makes my point on the conflict of interest issue. that was what they offered to do – no me or us it was OR who suggested this. it would have increased the line length by about 4-5m which is irrelevant to any measurement on ADSL. The PCP is against the wall of the exchange. adding 5m to the cable length would make an unmeasurable difference to ADSL performance and would add FTTC to those same lines for everyone. You could make the same argument for any EO arrangement that the line will be fractionally longer when it has been lifted into a PCP where it once ran direct. If this really is a barrier to EO rearrangement them I am sure OFCOM could be prevailed up to clarify that say anything under say 10m of decent cable doesn’t matter. Where I used to live has a g.fast pod on the NGA now – grrrr! Looks like they are replacing some cables etc in the next few days and g.fast has been hinted by an engineer – but I guess we will have to wait and see. I am not hoping as I know it won’t happen. but forever hopeful! I used to work for OR until recently and had the following discussion with a level 1 manager. I said that not only would fttp (country wide) not happen in either his or my lifetime I also stated that it wouldn’t even happen in his children’s lifetime I wonder who will be proved right ?. Still can’t even get fttc where I live and that’s in a medium sized town where all but two cabs have been fibered up three years ago. The company are a law unto themselves with no real interest in the end users.